Half-Past Kissin' Time: An Album is Worth 10,000 Words! An Album is Worth 10,000 Words! 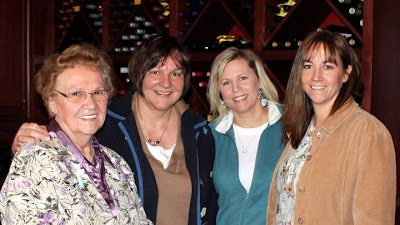 Recently, I met my mom and sisters Mary and Michelle for a birthday brunch, and I received a gift that is so special that I have to share it with you! Michelle stalked my Facebook page and Posterous blog (where I keep my favorite photos) and created one of those She'd-never-do-this-for-herself,-so-this-is-AWESOME type gifts! It's a coffee table book made completely of photos I've taken (plus my favorite one from Camille). It's fantastic, and I LOVE it. If you'd like to see the digital version, view it here. If you have a friend or someone you'd love to do this for, consider using Picaboo. Michelle said it was very easy to use. If you use this link and join (It's free! ), both you and Michelle will receive $10 in "Picabucks," too! Picaboo is amazing! I made a book of our life in pics for 2010, and it was amazing. Easy to use and they have some wonderful promo deals! what a great gift!! i love doing that for folks, albums or keepsakes are totally personal and sweet!! It's one thing to put together an album of lovely photos, but she chose the perfect backgrounds and combined the right photos together to make it truly spectacular. I just love it! These albums are wonderful. My Geek Son and his wife, The Latin' Lovin' Hillbilly put together an album of their fab four. It's a treasure for sure! What a wonderful gift for you. God bless and have a fantastic day sweetie!!! I can't think of a gift that could have meant more. Certainly a treasure-for-a-lifetime gift. You're welcome! I love you, too. It was my pleasure - so much fun to make! Hey, Everybody! Today's Groupon Deal is $35 for $100 of Picaboo $$. Email me if you'd like the link! You realize that every time you say "Michelle" I get confused, right? What a great gift - and how thoughtful and perfect of her to have made that for you.